Roaches bugging you? Kill them quickly with this amazing homemade and all natural pyrethrum spray. Learn how to easily make it at home. 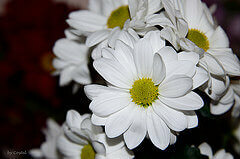 It is a daisy flower native to Asia and northern Europe. You may know it as chrysanthemum, or just mums for short. Pyrethrum has been used as a natural insecticide for hundreds of years. The toxins produced by these flowers, pyrethrins, will kill insects on contact. They attack the nervous system and cause paralysis. You save money. When a small organic spray bottle can cost over $20, saving a few bucks is well worth it. All natural. You can guarantee this because you know exactly what was used and how it was made. More killing power. You get a more potent roach killer when it’s freshly prepared. Pyrethrins break down quickly–losing over half its killing power within just hours of exposure to light and air. The flower is where the toxins are most concentrated (the seeds of the flower head to be more specific). The best time to harvest them is when they’re in full bloom. Dry the flowers by hanging them upside down in a cool, dry and dark place. A small closet is perfect for drying chrysanthemums. Use a large cardboard box for drying. If you want to speed up the drying process, use a fan. A clean spray bottle. You can usually find one for around $1. Try your local dollar store. Distilled water, bottled water, or just plain tap water. Yep, that’s all you need to make this. Crush the flower into a powder. The finer you can make it, the more potent the spray will be. The water to pyrethrum powder ratio varies because the exact concentration of pyrethrin is unknown and varies from flower to flower. You have to test and adjust until you get the right mixture that works best for you. In other words, just keep mixing in the powder as long as you have a liquid mixture that can be sprayed out of the bottle. Shake it up really well before each use. Tip: Some users have recommended adding in a few drops of dish soap to the mixture. The exact reason for doing so is unknown, so if you know why then please shoot me an email. Pyrethrin will break down much faster when exposed to light, oxygen, and heat. The best time to spray it is in the evening, or early in the morning. I recommend the evening. Disregard this if you’re using it to kill roaches on the spot. Just spray them if you see them. CAUTION: Even though it’s natural and usually harmless to us in small doses, take caution not to spray your food, or surfaces you’ll be eating from. You can also use it to spray along baseboards and high roach traffic areas as mentioned in my other post about Demon WP being the best roach spray in terms of killing power. The only difference is you need to apply the spray every night before you head to bed. Place the dried pyrethrum in a zip lock freezer bag. Store it in the freezer for up to 6 months. This natural solution kills roaches just as well as the man-made insecticides such as cypermethrin, etc (the stuff professional exterminators love to use). The only difference is it doesn’t stay persistent for much longer than a day. If you’re looking for staying power, consider the man-made stuff. However if natural is what you want, and on the spot killing is desired, then using this homemade roach spray to kill roaches and boric acid or baits might work for you.